Save up to 35% Daily deals. 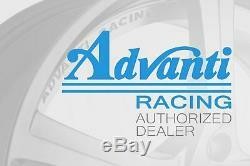 Advanti Racing STORM S1 Wheels 15x7 (+35, 4x100, 73.1) Gray Rims Set of 4. In Stock: Ships in 5 days. On the go Daily Deals. STORM S1 Matte Gray wheels by Advanti Racing®. 15" x 7", +35 Offset, 4x100 Bolt Pattern, 73.1mm Hub. Designed to emphasize the sporty look and dynamic character of your performance machine, the Advanti DST wheel sets out to bring you a fusion of iconic, timeless style with aggressiveness. Blending chic, trend-setting design with state-of-the-art Dynamic Spinning Tech. This wheel offers the perfect combination of immense strength and lightweight, while giving your ride that bold, intimidating attitude you want. Lip Size, Concavity, and overall Appearance, may vary depending on Vehicle and Wheel Size. Once Tires are mounted onto Wheels, the wheels become Non-Returnable. Feel free to contact our dedicated Wheel & Tire team with any questions. Made by using Flow Forming Technology. Exquisitely crafted for those hungry for luxury with racing attitude. One-of-a-kind, trendy design to make your car stand out from any crowd. Ideal upgrade for your sport luxury vehicle demonstrating power and strength in every single line. Fusion of cutting-edge technology and ingenious verve for impeccable style and performance. Will spice up your ride with aggressive elegance and lavishness. Premium-grade construction provides years of lasting beauty. Provides a perfect blend of immense strength and light weight. Offered a variety of chic finishes that accentuate the beauty of artful expression. Available in a variety of sizes and bolt patterns to ensure a perfect fit to your ride. Offered in the most common dimensions to fit different vehicles. Bring a new sense of opulence and chicness to your four-wheel passion with the exquisite Advanti DST wheel to make it stand out wherever you go. With an elegantly crafted, one-of-a-kind design and state-of-the-art innovation, the DST wheel offers a refined blend of extraordinary luxury and timeless aesthetics with edginess and aggression. The pinnacle of contemporary sophistication, the Advanti wheel will transform your performance beast into the embodiment of lavishness, boldness, and intimidation. From matte black, gloss black to titanium mirror, hyper silver and gunmetal to matte bronze and grey to gloss red, this wheel comes in a range of trend-setting finish option that will add a sublime accent to your vehicle's exterior. The contrasting machined face adds an extra level of detail and powerful look to your ride. The Advanti DST wheel is born out of the artistic expression combined with know-how to bring both impeccable style and many years of lasting beauty. Dynamic Spinning Tech (DST) is Advanti Racing's latest propriety technology to hit the aftermarket wheel industry that allows the wheel to be make extremely lightweight, strong, and durable to dial up your maximum levels of driving enjoyment, providing more responsive acceleration, lowered stress on the tire when braking, as well as superior ride comfort. Using the flow forming technology to apply pressure on the inner wheel after casting, the DST process stretches and forms the material, resulting in greater tensile strength similar to forged wheels. The result is greater strength, reduced unsprung weight, shock resistance, and higher load capacity over conventional gravity cast wheels. These characteristics subsequently translate into maximizing overall vehicle performance. This classy and aggressive custom wheel can become that single difference-maker that will elevate your vehicle's style above the rolling masses and make it truly unique and personalized. So, if you're on the hunt for bespoke luxury and panache with a race-ready look, the Advanti DST wheel is what you need for showing off around town or dominating the highway. A YHI® Manufacturing Group proprietary brand, Advanti® Racing Alloy Wheels was launched in the mid-90's by launching the first manufacturing plant in Taiwan. Along with the plant, the in-house engineering of the company was launched and has proven to be successful over the years. Nowadays the plant is producing the wheels for the famous brands like Lowenhart, Racing Hart, Yokohama Wheels, Giovanna. All of the wheels are manufactured with focus on quality and are thoroughly tested. We know how much of a financial investment you're making in a set of wheels or wheels and tires, and in return we'll deliver service and product that is second to none. We take pride in our fitment information and don't take our fitment guarantee lightly. You can depend on the fitment advice from our professionals because they have decades of knowledge and experience to draw from. Research the brands of equipment we use and the wheel accessories we offer and you'll find they're the finest in the industry, because we want you to have the best. The combination of products and services we provide cannot be matched, especially by a local tire store. No matter whether you're doing basic repairs and maintenance, modifying your car's street appeal and performance, or adding high-tech lighting and electronics, our great selection of brand name products and knowledgeable associates will ensure success with all your automotive projects. We offer the finest and widest variety of automotive parts and accessories using state-of-the-art technologies, and employ the most dedicated and creative team members. These individuals focus on exceeding expectations of customers who want the exact component at the best price in the quickest time. Our goal is to provide a WOW experience during every customer interaction. Whatever you need, whether it's a replacement part to fix a broken down vehicle, a crash part to repair a vehicle from an accident, perhaps a new set of custom wheels and tires, or something to make it flashy or faster, lifted or lowered, we will be your one-stop shop. 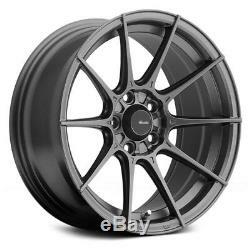 The item "Advanti Racing STORM S1 Wheels 15x7 (+35, 4x100, 73.1) Gray Rims Set of 4" is in sale since Friday, November 2, 2018. This item is in the category "eBay Motors\Parts & Accessories\Car & Truck Parts\Wheels, Tires & Parts\Wheel Lugs". The seller is "caridwheels" and is located in Plainview, New York. California Prop 65 Warning: This product can expose you to chemicals including lead, which is known to the State of California to cause cancer or birth defects or other reproductive harm.